And already it is the end of week five – can’t believe it – only a week to go before the site is put to bed for the winter and we have to wait another ten and a half months before we can start again. Today, the BBC wrapped up their last take for this year and packed away their cameras. They all seemed very pleased with the results so far and are talking about coming back next year to continue filming – “Ness the mini-series”! “And cut. 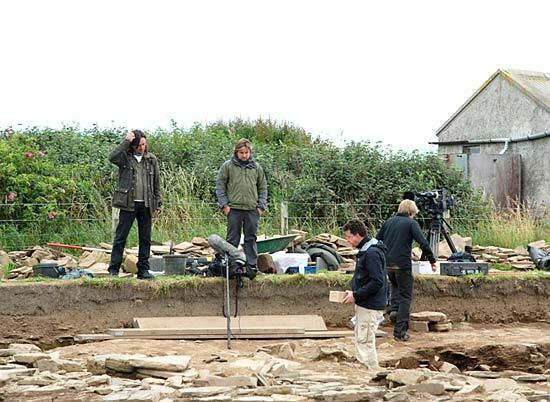 It’s a ‘wrap'” – the BBC crew finish off their filming. Structure Eight continues to produce yet more “exotic” items to add to the whalebone macehead, whaletooth, stone macehead, polished axes etc. Dave, while working in one of the recesses, discovered a lump of, what we presume is, shale, which has been shaped. Sarah was brought in to assist in lifting this — as is so common with shale items, they laminate badly and this will need conserving. After some delicate maneuvering, and defining, this item was successfully lifted in one piece. Sarah carefully uncovers a shale object. Soon after, Dave once again made yet another startling discovery – this time a large piece of “exotic” green stone that appears to have been partially smoothed and polished – is this an unfinished axe? The stone itself has been crushed and broken and its unfinished surface almost seems to have decayed. Dave however managed again to lift the item as a whole so it can be sent off for conservation. Nick Card, the excavation director, seems to remember a similar stone type being used for a polished stone axe discovered at the Neolithic site of Crossiecrown, just outside of Kirkwall. Dave excavating his exotic, greenish stone in Structure Eight. Excavation in Structure Ten ceased today so that we (royal “we” – mainly Antonia!) have plenty of time to do final recording, photography and planning. Most of the dream team are, unfortunately, leaving today – Adam, Mike, Clare and Ken – many thanks to you all for your amazing talents that have helped get Structure Ten to this stage. With the floor deposits peeking through across much of the now well-defined central chamber, it’s almost exactly the stage we hoped to be at by the end of this season. Next year we will be able to start immediately to excavate the floor layers that should give us a much better idea of how this building was used. Jenny with the latest axe discovered in Structure Twelve. And so excavation across most of the site draws to a close to allow final planning etc. A final layer is removed across the interior of Structure Twelve; refinement of the potential complex entrance arrangement at Structure Twelve’s north end comes to a close; and a sondage (trial trench) across its supposed robbed out east wall has revealed that the this wall may not be as badly robbed as we first suspected, with wall faces surviving just below the robbing debris. In Structure One, the later deposits associated with the strange oval structure that was built in its interior have almost been totally removed. Post excavation analysis of these layers should hopefully illuminate the nature of this enigmatic late structure. We presume that it represents a phase of ephemeral “squatting” in the remains of Structure One. Close to Structure One, Ali, Mike and Andre have been further investigating Structure Eleven. Although appearing to be late in the overall sequence of the site, like some of the other buildings on site, the more you reveal the less clear this structure seems to become – strange, blocked up doorways, the lack of any obvious floors, the integration of bits of walls from perhaps several earlier structures, collapse and slumping into structures below etc etc – the archaeology is never simple and takes a lot of head scratching – still sure it will all be totally clear next year! Hello there and welcome to Friday’s installment of the blog from the Ness of Brodgar. It’s Simon again today and I’ll be guiding you through the events and progress of the day so far. Perfect conditions on site today, not perhaps for archaeology, as various bits of loose soil fly around the site, but certainly for Neil Oliver’s locks to flow in the manner we all know and love! We welcomed Neil and the BBC back this morning to continue their filming of the upcoming documentary on the site and once again despite the, I’m told, “light breeze”, there is a real buzz around site today as there was yesterday with ever increasing numbers of visitors to the site. Mike Parker Pearson is back today which is a pleasure to see (and I’m not just saying that because he signed my book). Mike is digging in Structure Eleven, where yesterday was found a flint borer and polished lump of hematite. I think it’s testimony to the site that so many people, archaeologists or otherwise, are coming along and getting involved in the action. This site, as I implied in my previous entry, is one of beauty and spectacular importance… two factors, I’m sure you’ll agree, that naturally attract people to come and visit. In Structure Twelve, Owen and the team have begun to deconstruct the rubble in the entrance and it is beginning to take shape and look beautiful, alas very few of us are feeling equally attractive today after the team went back to Nick’s last night for “a few drinks”. In fact, Structure Twelve has become a hive of activity recently with regular finds of bone and pottery but also a polished soft stone axe (discovered by Jenny) which has now had to be stored to prevent fragmentation. It seems that the concentrations of tools, of pottery, bone and art are relatively evenly dispersed around the site with bits and pieces turning up all over the place! Pottery and bone continue to be found across the site, with some very nicely decorated Grooved Ware coming up. Aside from the archaeology there is still, as I mentioned before, this buzz of excitement and happiness around the site, which is one memory I will certainly be taking away from the dig. It is undoubtedly the media coverage and the presence of the BBC as well as word of mouth that is facilitating such a wealth of excitement across the site and long may it continue! Last night Nick and his family put on a fantastic evening for all the staff which was fantastic. With the Ness of Brodgar being such an expansive site there are always faces you see in the crowd at lunchtime and think to yourself “I’ve not actually spoke to you yet”. Last night was the perfect tonic for this with everybody mingling and socialising, I think I can say on behalf of everyone in attendance a big thank you to Nick for arranging such a fantastic night! Sadly, I’m leaving the Ness today and heading back home to Suffolk. I’ll try not to pull on your heartstrings too much but what I will say in essence is that I have had just the most incredible three weeks here in Orkney and am sad to be leaving! The combination of the people I’ve met, mixed with the fantastic archaeology we’ve all been uncovering, has made my stay here such a happy one and I thank everyone for being so friendly and also to many others for propping up the bar with me! I’d also like to extend these thanks to Nick for giving me the opportunity to dig on such an extraordinary and revolutionary site as the Ness of Brodgar. As I’ve said before, the archaeology being discovered here is shaping the way in which we perceive Neolithic Orkney and to be a part of this excavation is truly and wholeheartedly a dream come true! Although I’m sad to leave, I will be coming back next year and wreaking havoc on everyone all over again! So this is not goodbye. More of a “see you later”.